We talk a ton about text marketing for restaurants and retail locations, but membership based gyms actually run a close second. We’ve seen hundreds of fitness centers grow while using our service. Here are a few campaigns that will help kick off your text marketing efforts. Promote the “bring a friend” special. Even though membership based businesses offer a pretty predictable income, you still want to encourage steady, month to month growth. Ask members to bring their friends, and if a new sign up occurs as a result, reward these members for their referral. Run a text to win contest with a huge incentive. Let’s say business is pretty slow during the cold weather months. Why not kick up the incentive by running a text to win contest? Make sure the grand prize is super appealing; maybe something like a free family membership for one whole year. This will encourage a drastic amount of opt ins. These are people that you can market to long after the contest is over. Send out annual renewal text reminders. Membership based businesses are financially lucrative until the membership expires. Send out automated reminders when a membership or deal is about to expire. If you’re a large franchise, our team can work to integrate your CRM with our API. If you own a smaller, local gym, give us a call and we’ll show you how to send out monthly text message reminders using our custom fields feature. 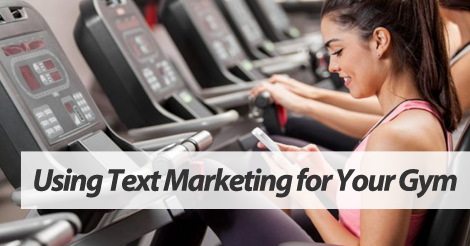 Want more text marketing ideas for gyms? Give us a buzz, or surf around our Learning Center. Here’s the deal. Text marketing isn’t rocket science. But, if you’re not taking full advantage of our service and the features we offer, you’re definitely missing out on some huge growth opportunity. As a gym owner, you should be using the following features. Text your members on their birthday with a special gift. This is probably the quickest and easiest way to grow your text marketing list. Set up regular drip campaigns that reward members for their loyalty. For example, three months after opt in, fire out a message that offers a discount on another club service.